Sarah from Gurney's Seed and Nursery talks you through the process of planting and thinning radishes from seed. 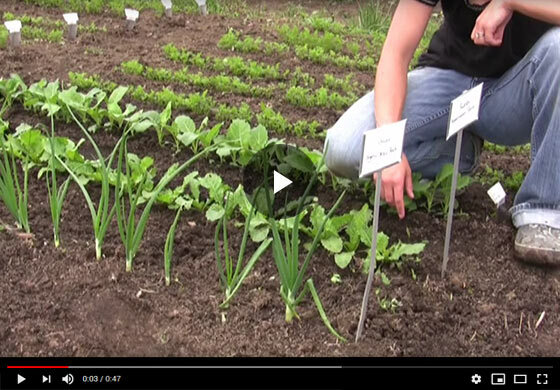 Learn what's the right planting depth and spacing for radish seed, and more useful gardening tips. Hi, I'm Sarah with Gurney's. Today, we're going to be talking about radishes. As you can see, I've already got these sowed in and they're pretty happy. I planted the seed about a half inch deep, I always over seed and then I like to go back and thin later. I do my rows about twelve inches apart, you want to shoot for twelve to eighteen inches apart, and so, I'm going to thin these just a little bit more today, but not a whole lot. I like to wait a while, make sure I pull out the weak ones and not the strong ones. Radishes, you can start as soon as your soil can be worked in the spring and then you can do a later sowing in the summer-mid summer for a fall harvest and they germinate pretty quickly and days to harvest are fairly quick so they're a nice crop to do. Just pull out the small ones in between here, and you can just throw them in right into your aisle or put them in your compost bin. Some people have a hard time thinning because they hate to get rid of their good plants, but you got to remember that you're helping the plants creating room in the ground.